ISO 9001. CERTIFIED TRANSLATION QUALITY by Skrivanek. We make every effort to ensure that the translation and teaching services provided by our company, as well as all its operations, comply with the applicable quality standards and EU directives. 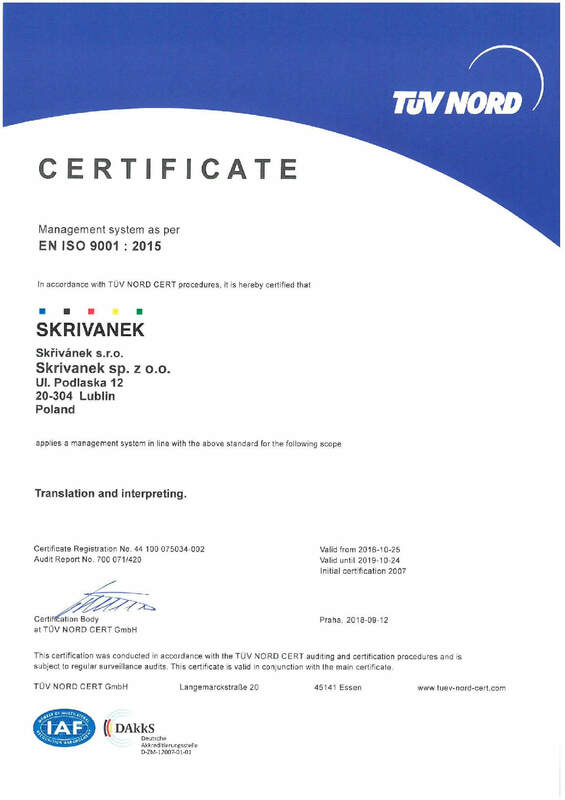 Within our mission to “provide our business partners with dedicated, innovative and comprehensive language services meeting the highest quality standards”, it was necessary to implement the ISO 9001:2008 quality management standard. What is the role of this standard? Standards in the ISO 9000 group cover various aspects of quality management. Under the standards, companies and organisations willing to ensure that their products and services meet the high demands of the clients and constantly improve in quality are provided with detailed guidelines and useful tools to help them implement these principles. The standard builds on many quality management principles, such as customer focus, the process approach, the encouragement and engagement of top management and the policy of continuous improvement. We recommend that you read the “Quality Management Principles” document, explaining these principles in more detail. Using an ISO 9001:2008 compliant quality management system ensures that clients always receive high-quality products and services, which should in turn translate into tangible business benefits for both providers and clients. The constant monitoring of the proper functioning of the system is an integral part of ISO 9001:2008. Organisations must periodically conduct internal audits in order to check whether their quality management system is working as intended. They can also choose to hire an independent certification organisation to assess their compliance with the norm, although this is not a requirement. Importantly, the certified organisation can, and sometimes even should, ask its clients whether the quality management system implemented in the company fully meets their demands.